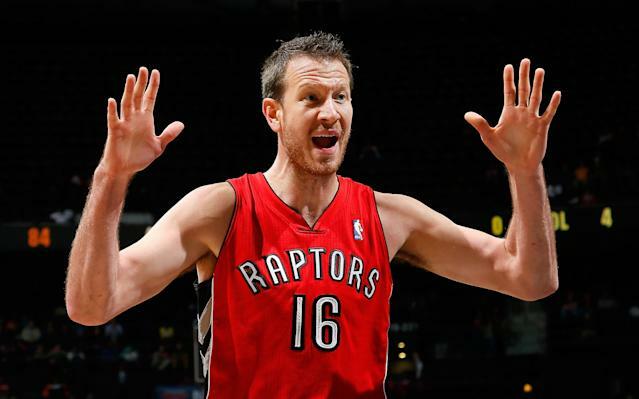 In a move to create salary cap space, the Toronto Raptors have reached an agreement to send Steve Novak to the Utah Jazz, league sources told Yahoo Sports. Along with Novak and the two years and $7.2 million left on his contract, the Raptors will send a future second-round draft pick to Utah, sources said. The deal can't be completed until the league's moratorium ends on Thursday. The Jazz will send the Raptors guard Diante Garrett, who, with a $915,000 non-guaranteed deal for this season, will be waived, sources said. Novak, 31, gives the Jazz a three-point-shooting specialist whose career had taken a step back in limited minutes with the Raptors last season. Novak had played 20.3 minutes per game for the New York Knicks in 2012-13, but a trade to Toronto severely cut into his playing time and production last season. In eight NBA seasons with six teams, Novak has averaged five points per game. He was a second-round pick in 2006 out of Marquette, where he played for coach Tom Crean.